I for one care. I love the K900 (and its Genesis G90 sibling). You’d have to be a fool, a badge whore or both not to see the massive value these things have, especially used. With this being Kia of course, they pack in the value. The standard features list is long and is thousands less than comparable competitors like the LS and the S Class. On Kia compare models site though, weirdly it has its main competitors as the LS, the CT6 (?) and the Continental (??). Both the Americans are point for point on it with price, but I think the K900 might be the better value. It even has a haptic steering wheel that works in conjunction with the drivers aid that vibrates the wheel if an impended threat is detected. 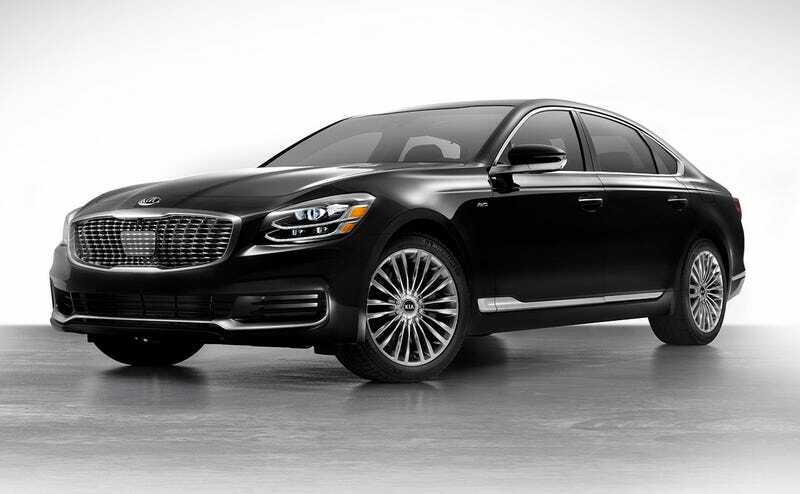 The only difference with the K900 this time around and what sets its apart from its competitors and its G90 cousin are that you cant get a V8 on it anymore. The sole engine option is the 3.3 liter twin turbo V6 with 365 horses shared with the Stinger. It gets mated to an 8 speed auto and is the only luxury other than the A8 with standard AWD. The leather color choices are just Beige,Black and Sienna Brown which is like Peanut Butter. All are no cost options. I of course chose Black on Sienna Brown. And as mentioned, the damn rear seat armrest has a wireless phone charger which I find fantastic. There aren’t any other options except a $120 bumper applique, a $265 paint protection package and $55 wheel locks. All in, a loaded K900 with the VIP package will set you pack $64,895. That’s a bargain when you consider the Japanese and the Germans. Hell even a comparable CT6 will set you back at least $20-30 grand more with similar options or if you want anything decent out of it. And don’t forget how much of a steal this thing will be in 2023 with 30k miles.